The Train now arriving ..
After such hard work to get the Rocks by Rail Museum ready for its opening on 16th September, there remained two important aspects unresolved and unknown – the weather and the number of visitors! To much relief, the day dawned bright and from a chilly Autumn morning developed into a warm and sunny day which was a fantastic bonus for the opening. The volunteers need not have worried about visitors, guided to the initial event by local and national press coverage, the local Rutland Radio, community leaflet drops and the steady word of mouth in the area. In fact, the unforeseen problem was the capacity of our large car park which was tested to its limit during the day. With popularity like this, perhaps we need to bring a car park extension up our priority list! We estimate that around 1,500 visitors called in to see the event during the first day of operations. Having started tentatively in the morning with passenger services as well as full operation in the quarry area, with diggers, trains and shunting in full swing, a brief pause at 2pm allowed birthday celebrant Ed Milner, his wife Val and their train mad three year old son to cut the tape to dedicate our new platform to much cheering and loco whistling! Surely the 16th September 2012 will be remembered in the history of the Charity as one of the defining moments. For photos of the day, click here – taken by our member Jeff Hodgson. More photos to follow! With the landscaping team still in full action, it was with real pleasure that we welcomed the first trial passenger train into the new platform yesterday afternoon. 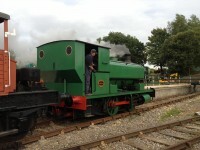 Overseen by our external Independent Competent Persons (ICP’s), and after the finishing touches to the facing point lock mechanisms, the technical adjustment of the vacuum braking systems, and completion of safety fencing around the Museum, the Andrew Barclay steam locomotive SIR THOMAS ROYDEN (Works Number 2088) had the honour of hauling the first movement into the platform. The first run was delayed as a red lamp had to be found for the new buffer stop at the end of the passenger running line. As part of the completion of the rebuilding works we have had to ‘prove’ the standards of the track, locomotives, vehicles and most importantly the volunteer competency to operate. As a result, we organised a full dress rehearsal under the watchful eye of the external assessors to ensure that all would run smoothly at our reopening. After such hard work on rebuilding the Museum railway, the volunteers were very relieved that the final safety assessment, received late last night was positive and will allow us operate a full service on Sunday. We now look forward to opening our doors on Sunday to visitors from the local community and perhaps those enthusiasts from further afield looking to find a rather unique heritage experience. OMG – Three days to GO! As you can imagine, your hard working Secretary/General Manager/gopher(!) is starting to get slightly worked up about the remaining jobs needed to deliver the Museum as a presentable and complete visitor experience! With three days to go, we have been contacting a whole range of supporters, local businesses, experts and volunteers in a week which has come close to the ‘Challenge Anneka’ episodes well remembered from my youth! While the daily volunteer briefing outlines a hit list of jobs that must be completed, it has been noticeable that we tend to start each day with about a dozen items, replaced the next day with another 12! 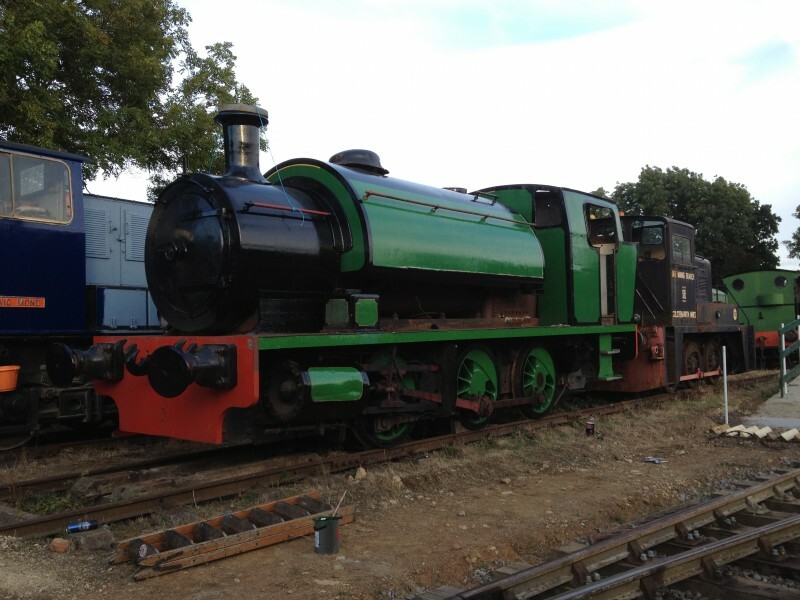 One volunteer saw that the presentation of the Exton Park type Yorkshire Engine Company locomotive 2521 required a little attention – a job added to the list during the day, but with a little cooperation from the rest of the team, completed before the end of the working session. Now relocated to the most prominent location in the loco exhibit yard, visitors will now see a loco in tip-top condition! We have come across some real stars from the local community though, whether helping us deliver invites to the local villages, our regular mini-digger driver or the catering expert found at the last moment, all willing to lend a hand. So, with three days to go, it looks as if the team will complete their ‘to-do’ list but so long as we don’t find too many more jobs to do!